Photo by Tica Clarke Photography. After being heavily involved for more than 15 years in rescuing and retraining hundreds of dogs from every Central Texas animal shelter, I’ve seen just about every behavior — good and bad — that a dog can offer. I owe my deep understanding of canine body language and canine communication to those 400-plus dogs I have fostered and trained, as well as to the thousands of client dogs I have worked with. I’ve achieved a high level of training with my once semi-feral Border Collie siblings, Radar (CGC, CGCA, B.A. and Canine Masters with Honors, Birch, Anise and Clove ORT) and Echo (CGC, CGCA, B.A.,Canine Masters with Honors and a Certified Therapy Dog). 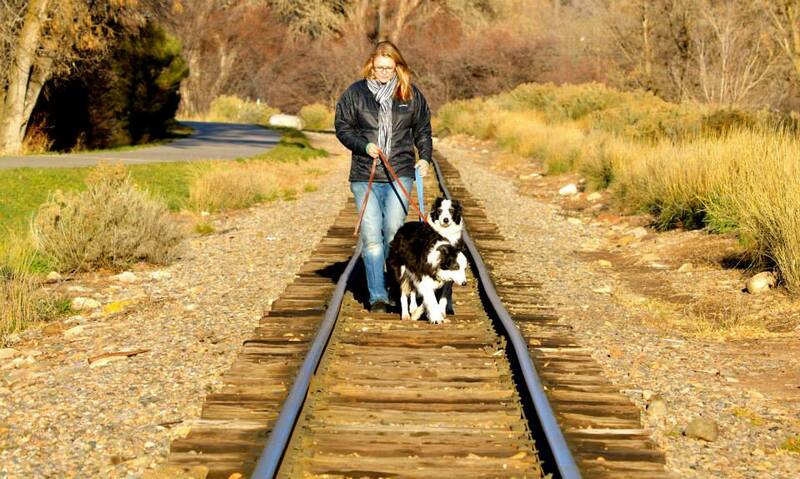 In addition, my three rescue dogs have extensive training and assist me daily with reactive and aggressive dogs. I am a graduate of an intensive, Schutzhund-based canine training academy where I was taught how to use the shock collar in punishment-based canine training (telling the dog what he is doing wrong). After learning the ins and outs of a shock collar and after witnessing all kinds of dogs endure this kind of training, I never again put a shock collar on a dog. I choose to be a positive reinforcement trainer (telling the dog what he is doing correctly) because it is not only humane training, I see no need to harm or scare a dog when I am able to get a high level of obedience and understanding from any dog. I stand with the countless professionals in the dog training industry who oppose the use of shock, choke or chain collars — there simply is no need to use such tools. These tools are outdated and in many countries they are illegal. 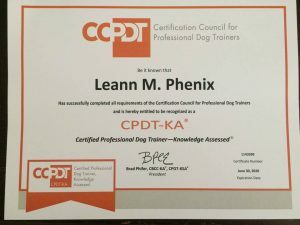 I am certified through the Certification Council for Professional Dog Trainers and I have passed an intense written exam that requires a minimum of 300 hours as a head instructor. 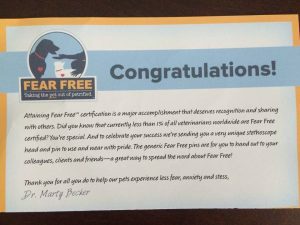 I am also a Fear Free Certified Trainer and one of the first trainers in the country to obtain that certification through Dr. Marty Becker’s Fear Free Program. I am also a nose work instructor. 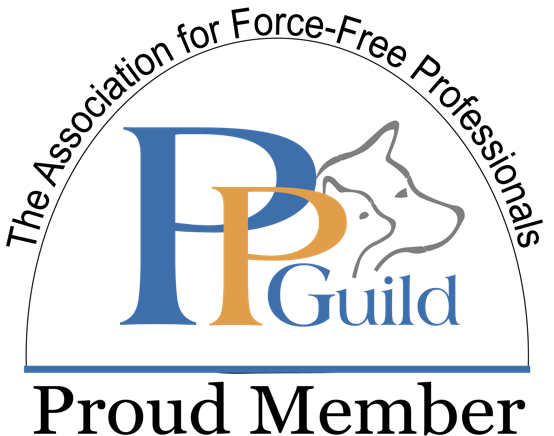 I am a member of the select group of trainers in the The Pet Professional Guild, The Association for Force Free Professionals. I routinely work with over-anxious dogs, putting to use the up-to-date knowledge I have learned from the industry’s leading professionals. Every year I attend workshops, seminars, view webinars, read (and write) countless articles and books to ensure my working knowledge stays current. 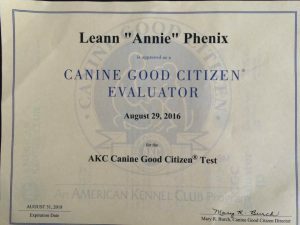 I am an AKC Canine Good Citizen (CGC) Evaluator and I have achieved the advanced CGC Title for my own dogs and countless client dogs. I am the Trainer in Residence for the world’s largest on-line dog community, Dogster.com, as well as the author of a training column called SPEAK! in the nationally syndicated Dogster Magazine (replaced Dog Fancy). I obtained a B.A. in English from the University of Texas at Austin and have been a professional publicist and a working journalist. 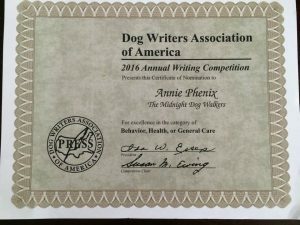 I am the author of the Spring 2016 book, The Midnight Dog Walkers: Positive Training and Practical Advice for Living with a Reactive or Aggressive Dog (Lumina Media). The book sold out on Amazon from early pre-orders and was named the #1 best book in its category on Amazon. The book was recently nominated as a national finalist from the Dog Writers Association of America. A new area of interest for me is the fast-growing sport of canine nose work. I am a graduate of two Train the Trainer Courses with Andrew Ramsey — one of the world’s top nose work trainers. I compete in nose work with my own dogs as well as train clients who are competitors or enthusiasts of nose work. I am a member of the National Association of Canine Scent Work. I am an active competitor in the sport and my 10-year-old Border Collie Radar passed all three odors in the Odor Recognition Tests (ORT), as did my 8-year-old All American dog Monster.